erythematosus, hemolytic uremic syndrome, sickle cell disease, and Henoch’s chorea purpura. Primary disease, the most common type of AGN is described as an immune-complex disease (or an antigen-antibody complex developed during the streptococcal infection which becomes entrapped in the glomerular membrane, causing inflammation for 8 to 14 days after the onset of this infection). AGN is primarily observed in the early school-age child, with a peak age of onset of 6 to 7 years. The onset of the classic symptoms of AGN is usually abrupt, self-limiting (unpredictable), and prolonged hematuria and proteinuria may occur. AGN results in decreased glomerular filtration rate causing retention of water and sodium (edema); expanded plasma and interstitial fluid volumes that lead to circulatory congestion and edema (hypervolemia); hypertension (cause is unexplained; plasma renin activity is low during the acute phase, hypervolemia is suspected to be the cause). Decrease in regulatory mechanisms (renal failure) with the potential of water. Child will have a normal fluid balance as evidenced by absence of edema, vital signs within the client normal limit, and balanced fluid intake and output. Monitor vital signs every 4 hours; notify any significant changes. An assessment provides baseline information for monitoring changes and evaluating the effectiveness of therapy. Auscultate breath sounds for presence of crackles. Observe for increased work of breathing, cough, and nasal flaring. Crackles upon auscultation indicate a fluid accumulation resulting in pulmonary congestion. Weigh the child on the same scale at the same time daily. Monitor intake and output accurately. Weight gain results from fluid retention; Accurate measurement of intake and output helps assess fluid balance. Measure and record abdominal girth daily. Edema normally observed in the abdomen which may increase as the condition progresses. Administer diuretics as prescribed. Decreases plasma volume and edema by causing diuresis. Instruct parents to maintain fluid restrictions as indicated. The amount of fluid allowed to take depends on the level of kidney function. Assist child to do position changes every 2 hours. Frequent position change lessens pressure on body parts and prevents accumulation of fluid in the dependent areas. Elevate edematous body part while the child is in bed or sitting in a chair. Helps move fluid away from dependent body parts through gravity. 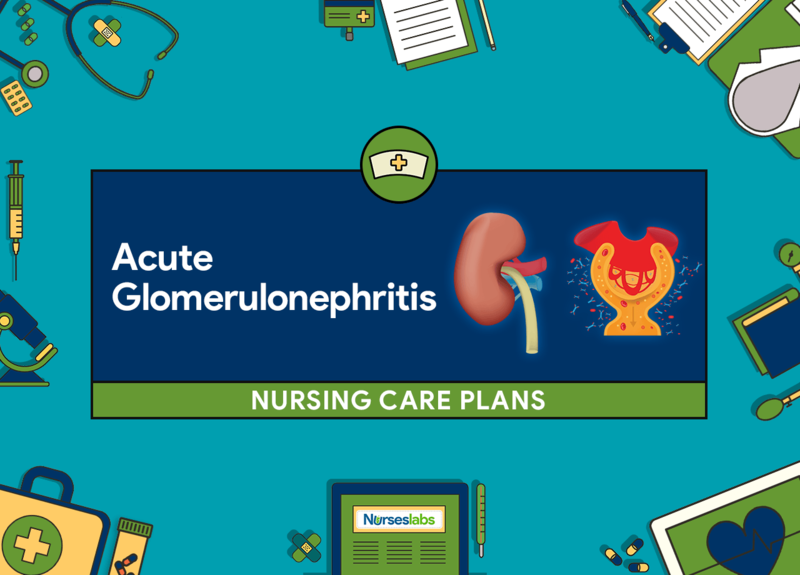 Explain to the child (as appropriate) and family about acute glomerulonephritis, including its signs and symptoms, diagnostics, and management. Provides an understanding of the disease which increases compliance with the treatment regimen. Refer to a dietician for consultation to develop a meal plan low in sodium, potassium, and protein that includes preferred foods as allowed. A proper diet plays a vital part in controlling the symptoms, maintaining nutrition and in the management of the disease. Child will progress to increased tolerance for an activity. Assess level of weakness and fatigue, ability to move about in bed and engage in play activities. Provides data about energy reserves during the acute stage of the disease and recognition of bed rest status. Encourage bed rest during the acute stage, disturb only when needed. Conserves energy and limits the production of waste materials which increases the work of the kidneys. after any activity in a quiet environment. Provides adequate rest and reduces stimuli and fatigue. Provide for quiet play, reading, TV, games as symptoms subside. Provides diversion, stimulation and requires minimal energy expenditures. Explain to the child and parents the purpose of activity restriction. Promotes understanding of the need to conserve energy and rest to help in recovery. Inform parents and child about the importance of rest after ambulation or any activity. Avoids fatigue and conserves energy during recovery. Instruct parents and child to rest when feeling tired. Prevents fatigue and promotes recovery. Child’s blood pressure will be normal within the range of the child. Child will experience an absence of headache and will appear calm. Assess blood pressure, pulse, respirations every 4 hours (monitor BP every 1 hour if diastolic is more than 90, pulse and respirations every 1 hour if tachycardia, tachypnea or dyspnea present). Provides information about the dangerous effect of hypertension which may result in encephalopathy, pulse, and respiration that change with heart failure and pulmonary edema. Assess changes in intake and output, extent of edema, decreased urinary output, headache, pallor, electrolyte balance. Reveals signs and symptoms of possible renal failure. therapy, cardiac glycoside as ordered; Observe for therapeutic effect. Provides treatment for complications if a more severe renal impairment is present. Observe behavior changes including lethargy, irritability, restlessness associated with hypertension and administer anticonvulsives if ordered. Indicates need for safety precautions associated with seizure activity as a result of cerebral changes. Encourage foods low in sodium, potassium, and protein during the acute phase of AGN; Instruct to increase intake of food high in carbohydrates and fats (only during the acute phase of AGN), as ordered. Provides nutrition during the acute period with the limitation of potassium during oliguria, sodium with the presence of edema, protein limitation if oliguria is prolonged. Limit fluids as ordered; allow intake of the amount lost via urine and insensible losses. Avoids additional fluid retention and edema in the presence of renal damage. Inform parents to report any weight gain, hematuria with decreased urine output, complaints of headache and anorexia. Provides for prompt intervention to prevent severe renal damage. Teach parents regarding dietary inclusion and restriction; provide a list of foods to include and avoid that comply with sodium, potassium, protein allowances. Provides nourishment while the disease is being resolved. Encourage to allow activity/rest periods as energy and fatigue require; progressively increase as condition warrants. Prevents fatigue and conserves energy during the acute stage and convalescence. Child will not experience sore throat. Child’s throat cultures will be negative. Assess temperature, chills, sore throat, cough (presence or recurrence). Reveals persistence of streptococcal infection. Obtain throat culture for analysis and sensitivities. Identifies streptococcal microorganism and sensitivity to specific antibiotic therapy. Administer antibiotic therapy to the child and to family members if ordered. Destroys microbial agents by preventing cell wall synthesis and prevents transmission to family members. Provide a proper disposal of used tissues and articles. Prevents transmission of microorganisms to others or reinfection. Instruct parents about the importance of taking the full course of the antibiotic therapy. Promotes parental understanding and prevents the development of super-infection. Instruct child and family to do handwashing after sneezing/coughing and to properly disposed used tissues. Prevents transfer of disease. Instruct parents to avoid exposure of the child to others with existing upper respiratory infection. Avoids respiratory infections in the susceptible child.